If Burslem can be said to have a first family then that role was fulfilled in the 18th century by the Wedgwood family. Various branches of the family occupied some of the most important estates in the town encompassing the Overhouse Estate, the Red Lion Estate and the Churchyard Estate (see the 1740 and 1832 maps). In the middle of the 18th century it was the Wedgwood's of the Red Lion Estate who made the most significant contribution to the development of the pottery industry in the area. 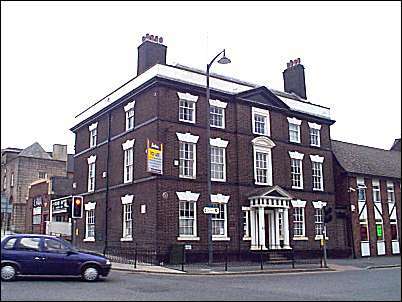 The brothers Thomas Wedgwood (1703-76) and John Wedgwood (1705-80) took possession of their father's Potworks adjoining the Red Lion Inn in 1743. Here they conducted a series of successful experiments to improve the quality of their pottery with the result that there was a rapid increase in demand for their products. "The excellent productions they now sent forth were so much in demand, that they erected a new manufactory, and incurred general censure because of their extravagance in erecting so large a manufactory and covering it with tiles, (all others being covered with thatch,) and for erecting three ovens, (subsequently increased to five.) Of the White Stone ware they now made dishes, plates, and common vessels, also some elegant fruit baskets, bread trays, &c glazed with salt, and probably cast in moulds; for the under side of the saucers, and the outside of the cups have different ornaments. The White Stone ware was varied into a better Tortoiseshell, by rubbing manganese upon the vessels before they were glazed; for a different kind of ground zaffres were applied with either a sponge or hair pencil; and similar application of calcined copper, iron, and other metals, produced Cauliflower, and Melon ware, &c. In 1750, the Brothers erected near their manufactory, (and now in full view of Waterloo Road to Cobridge,) a Dwelling House, so durable, and on so scale of extent, and a stile of magnificence, so far excelling all in the district, that it was called the BIG HOUSE; and now bears the name, (applied also to its founders, to distinguish the family, from that of the Over House, and that of the Church Yard Works.) These Brothers continued their manufactures until 1763; when they retired to enjoy a very large property, the reward of their industry and integrity." The Big House is illustrated above. Its relationship to its surrounding buildings has completely changed in the last 250 years (see photos below). When it was erected it stood at the front of an extensive factory all of which since been demolished. The 1812 map shows that the factory entrance was immediately by the side of the Big House where movement to and from the works could be readily observed by the owners. The house was separated from the road by a wall which enclosed a garden on two sides of the house (see maps 1812 and 1851). Architectural ornamentation was confined to the two elevations visible to the general public. The back of the house which faced the factory was built in a much plainer style. The Big House also stood at the head of a large estate. The brothers rent book shows that between 1740 and 1767 they spent £13,000 on the acquisition of land, houses and buildings in the area. The name Wedgwood Square simply reflects the fact that the whole of the North-East side of the town was the property of the Wedgwood family either of the Big House or the Over House. Most of the land on both sides of Hamil Lane formed part of their estate. 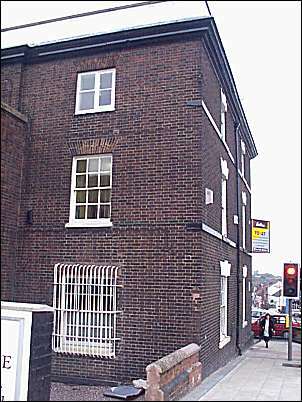 John & Thomas Wedgwood were the biggest and wealthiest property owners as well as pottery manufacturers in Burslem. They and their house, factory and estate dominated the town. 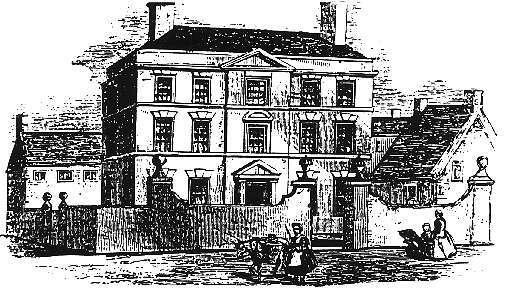 The Big House of John & Thomas Wedgwood built 1750.
to and from the works could be readily observed by the owners.